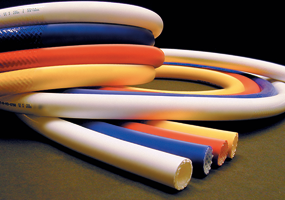 We can provide an extensive range of Saint-Gobain platinum-cured, sanitary silicone hoses. Including heavy duty, multi-ply, braided & wire-reinforced options for a variety of applications. The Sani-Tech range of sanitary silicone hoses all contain ultra-smooth inner bores and excellent flexibility – even when reinforced for high-pressure applications. 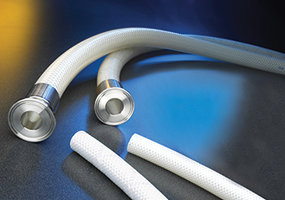 Sani-Tech STHT-R braid-reinforced, platinum-cured silicone hose is an ultra-flexible, high-purity hose that was developed for higher-pressure applications. This sanitary silicone hose resists temperature extremes, ozone, radiation, moisture, compression sets, weathering and chemical attack and imparts no taste or odors to fluids transported within it. It can cope with a temperature range from -80°F (-62°C) to 500°F (260°C). Sani-Tech STHT-R-HD heavy-duty reinforced, platinum-cured silicone hose is an ultra-flexible, high-purity hose that was developed for extreme elevated pressure applications. This sanitary silicone hose is available in 25 or 50 foot continuous lengths. Sani-Tech STHT-W wire-reinforced, platinum-cured sanitary silicone hose is wrapped with multi-ply reinforcements and 316 SS helical wire. It is extruded with a high-purity biopharmaceutical-grade silicone tubing inner diameter to ensure product integrity, and is designed for vacuum and tight bend radius applications. 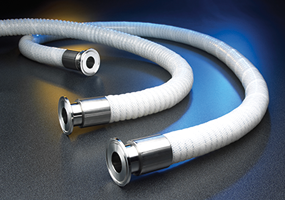 TYGON 3370 IB braid-reinforced, platinum-cured silicone hose is an ultra-flexible, high-purity hose that was developed for higher-pressure applications. TYGON 3370 I.B. is manufactured with a biopharmaceutical-grade silicone resin, resists temperature extremes, ozone, radiation, moisture, compression sets, weathering and chemical attack, and imparts no taste or odours to fluids transported within it. 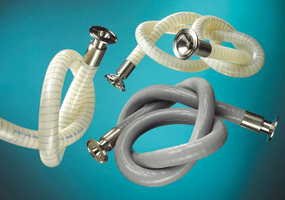 TYGON 3370 IB hose can withstand repeated autoclaving and sterilization, and also resists the adherence of blood products and sanitary fluids.